Seven Ninety Seven: They're A Go Again! Update: Remember these chairs that I started to remake over. Well, I stopped, Actually I stopped working on all my projects. I knew that we would be moving, so I waited until after we had a bigger place with a backyard because I needed the space to work. Now that I have that space my chairs will get the remake over I want for them. 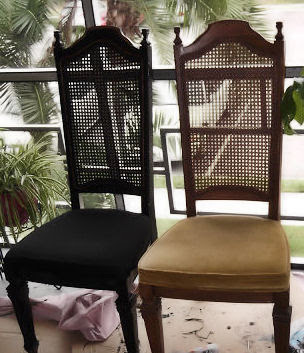 The chair on the right is going to go through a major stripping job to remove the bad stain. Then it with its three companions with be stained in the same hue as my folding table.